Ever since its introduction at the Salon International de la Haute Horlogerie (SIHH) in 2011, we’ve been waiting to get our hands on this Audemars Piguet Millenary 4101, ref. 15350ST. In the past, we’ve almost only covered their Royal Oak collection (here, here, here, here, here, here, here, here, here, here, here, here, here and here and then some more (114 times)). The only time we covered the Millenary collection was when we mentioned the Star Wheel and the introduction of this Millenary 4101 in 2011. We called it one of the nicest surprises in 2011 but in fact, we only got to lay our hands (and lens) on one just recently. Luckily, the sensation when looking at it was still the same as that very first acquaintance in 2011. As you could read above, we admit that the Royal Oak collection gets most attention here on FW and we have basically no excuses for ignoring the Millenary. As a matter of fact, there is no reason for us to dislike the Millenary at all. We’ve been a fan of the Millenary since those very first models in the 1990s (just before the new millennium), but had our focus simply on the Royal Oak collection. Much like Audemars Piguet themselves actually. The Millenary 4101 changed all that, as its beautiful appearance just struck us like lightning. Also, the size increased since those very first models to more acceptable dimensions (47mm wide and 42mm tall, 13mm in height). Especially for those who are used to wear larger (sports) watches. The version we’ve laid our hands on, is the stainless steel model with caliber 4101 movement, reference 15350ST.00.D002CR.01 – or just 15350ST. 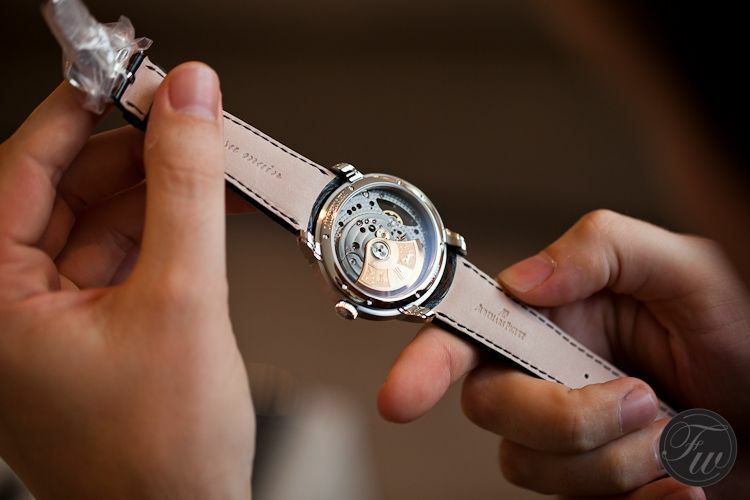 As you can see, the oval shape of the case is revealing a large part of its mechanical automatic movement. The round beautiful finished dial is only less than half of the size of the entire ‘dial’. 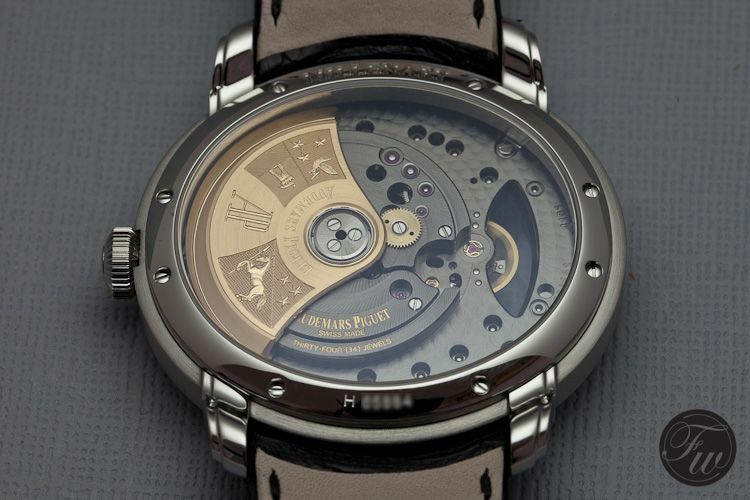 Obviously, the movement has been especially designed and manufactured for this oval shaped Millenary timepiece. 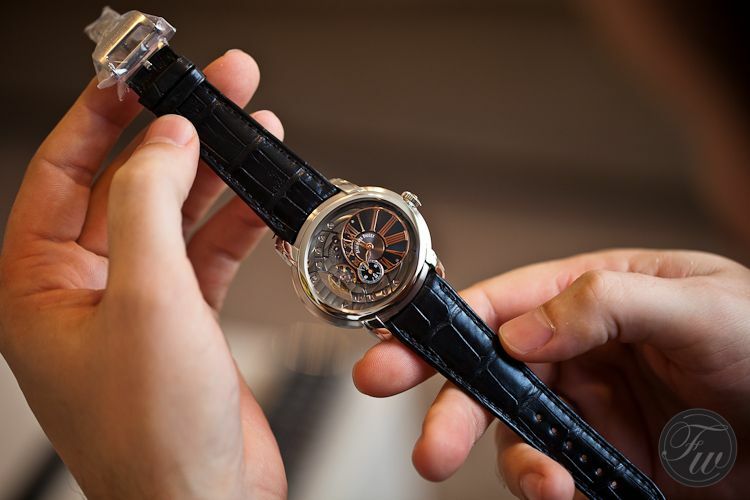 With the decentralized dial in the oval Millenary case, the left side shows the beautifully finished bridges (Côte de Genève) and Gyromax balance wheel. As one of the former Audemars Piguet catalogs described, you don’t have to take the watch off and turn it around to admirer the beautiful movement. We did it anyway of course, and took some pictures of the sublime looking AP caliber 4101 movement. The 22 carat gold rotor is very similar to what we’ve seen in the Royal Oak 15300 and 15400 watches with caliber 3120 movement. The oval main plate is hand decorated and has a perlage finish. 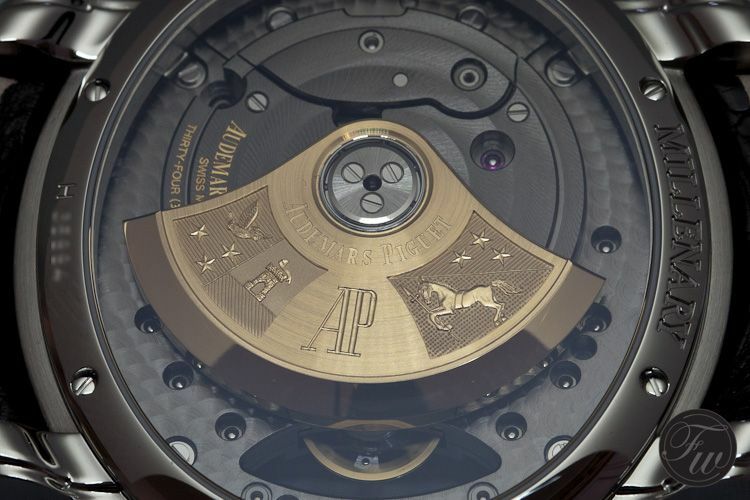 It also has this beautiful anthracite-like color which gives a nice contrast with the 22 carat yellow gold rotor. The 4101 Millenary movement consists of 284 components and measures only 7.46mm in height. The oval shaped movement measures 37.24 x 32.90 mm which perfectly fits the 47 x 42mm case. The movement has a power reserve of 60 hours, which is more than enough for an automatic watch without any complications. 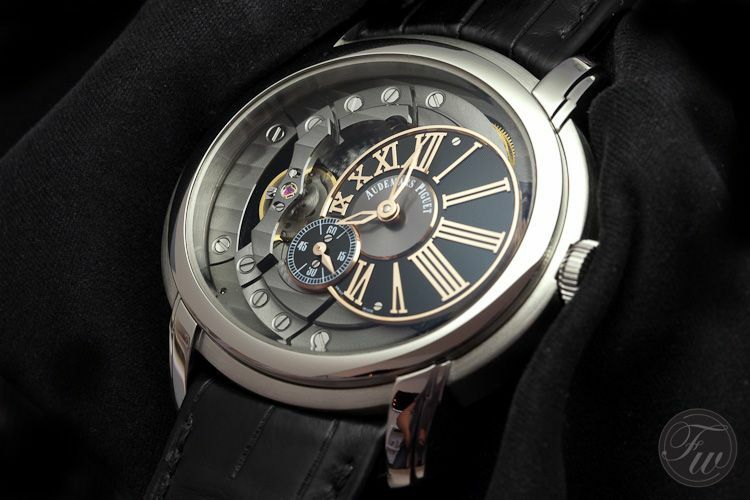 This Millenary 4101 is definitely a watch to consider if you dare to be different. The oval shaped case, open-worked dial and 47 x 42 mm dimensions make sure this isn’t your average high-end dress watch on a leather strap. Even though 2012 was, still is, the year to commemorate the 40th anniversary of the Royal Oak watches, we fell in love with this Millenary 4101 timepiece. Price of this Millenary 4101 is 20.500 Euro (approx. 26.500 USD), excluding VAT. The watch comes with a beautiful alligator strap and a stainless steel AP signed folding clasp. 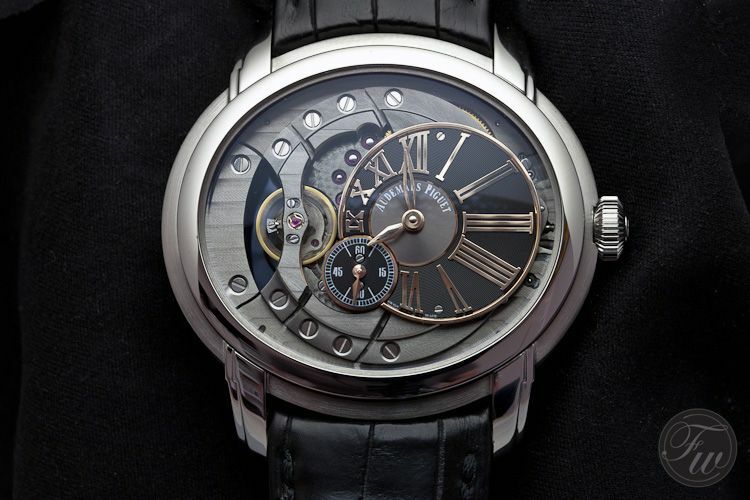 A big thanks to Audemars Piguet NL enabling us to fiddle around with this Millenary 4101. Download our Facebook Header picture of the 4101 caliber by clicking here. All pictures in this article can be clicked for a slightly larger version, showing more detail.